Pier-mirrors of this markedly architectural form and of Kentian style are characteristic of the work produced in Dublin in the mid-eighteenth century by Francis and John Booker. The architectural content of these Booker mirrors is close in form to designs by Willam Jones, in his The Gentleman or Builders Companion, containing a variety of useful designs for doors, gateways, peers, pavilions, temples, chimney-pieces, slab tables, pier glasses or tabernacle frames, etc, to which figures two and seven within this volume relate. Published in 1739, and imported into Dublin in the same year, it was sold for 12s. by Robert Owen in Skinners Row, which makes it highly probable that the Bookers may well have purchased a copy. The two brothers took over their father's business, following his death, in 1750 and are listed in Wilson's Dublin Directory between 1761-1763 at Essex Bridge as glass grinders, and as glass sellers between 1764-1773. Francis Booker became Lord Mayor of Dublin in 1772 but died during his tenure a year later. At this point we see a new label which replaced the Francis and John Booker label and became solely John Booker, which remained until 1786 when he moved to 4, Jervis Street, where he continued to work until his death in 1789. 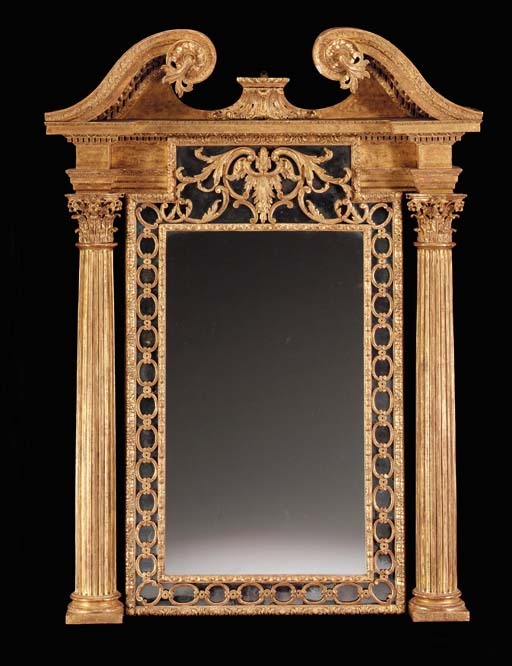 Typical of their work and exhibited in this mirror is the bold swan's neck cresting or sometimes broken pediment and the use of large columns, often with corinthian capitals, to the sides of the frame. Also particularly characteristic is the inter-locking pierced oval slip which is exhibited on a mirror, formerly in the collection of the Marquess of Dufferin and Ava, illustrated in, English Looking-Glasses (1670-1820), Geoffrey Wills, New York, 1965, p.84, plate 52, and The Knight of Glin, A Family of Looking-Glass Merchants, Country Life, 28 January 1971, pp. 195-199, fig.4, which also illustrates a very similar mirror to this example as fig. 5. Two similar mirrors were sold Christie's House sale, Newtown Park House, Blackrock, Co. Dublin, 20-22 September 1976, lots 53 and 54, of which lot 53 was labelled and a further pair of Francis and John Booker labelled mirrors from Charleville, Enniskerry was sold Christie's London, 22 March 1979, lot 16. Another labelled example was sold Christie's London, 27 June 1985, lot 130.